When I have a design quandary in my home, I seek advice from friends, but I tend to listen most to Bradley Odom. 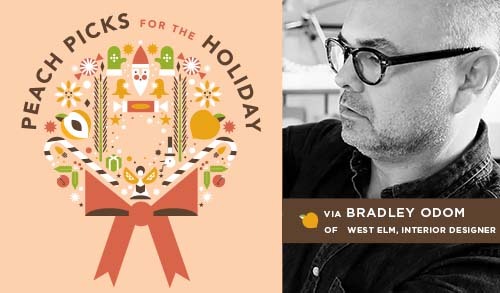 Bradley just graduated SCAD, plus he's the Director of Design Education at West Elm. None of that means I would automatically listen to his advice, except when I propose these decor problems, I always like his answers. He makes me see things from a whole new perspective that is at all times creative, technical and solution oriented. So I'm overjoyed that he shared his Holiday Gift Picks with Sweet Peach once again. (click here for 2013) These wonderful picks mimic his great eye and care for smart, beautiful (often luxurious) design. Thank you Bradley! Deco Letter Ornaments, $4 each. Holiday decor at West Elm gets better and better every year. My personal favorite for 2014 is a Deco Letter Ornament. Use a few to add sparkle and style to your tree or try tying them to each person's napkin at your next holiday party. Shotwell Candy Co. Caramels, from $9.75. These "Old Fashioned" buttery soft caramels are infused with aromatic bitters, Kentucky Bourbon Whiskey and orange extract. Whenever I have the pleasure to try one, I need a moment to savor and appreciate because each and every one is slap your mama good. Mountain Fresh Grocery Herbes de Provence Extra Virgin Olive Oil, $9.95. This is another no-fail hostess gift. I spend many long weekends in Highlands, North Carolina and each time, I buy a new olive oil flavor from Mountain Fresh Grocery to try. This one is by far my favorite. Artifact Uprising Print & Wood Cleat, $59. I love the idea of displaying an important photo in a new and unique way. Goodbye photo frame, hello wood cleat. Hudson|Grace Gold Gnome, $195. Red Gnome, $95. My friend, Monelle has the chicest home decor shop in San Francisco. As soon as I spotted these adorable yet sophisticated gnomes on her shelves, I knew they'd make for incredible holiday decor. Plus, they're an original, unsuspecting gift. Res Ipsa Wool Loafers, $225. A pair of these gorgeous loafers is a perfect gift for the discerning, fashion forward guy in your life. I've placed them on my wish list this holiday season as they're crafted from vintage hand woven Turkish rugs and finished with a durable leather sole and rubber heel. Perfect with a pair of jeans! 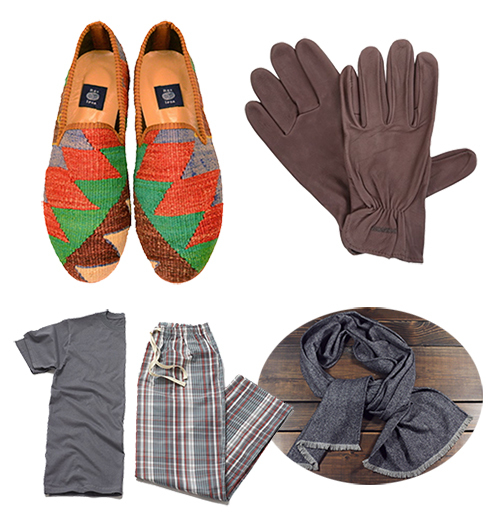 Sid Mashburn Filson Deerskin Gloves, $88. A friend of mine gave me this pair of gloves several years ago and I'm here to tell you, they will change your life. Made of 100% deerskin, these sumptuous gloves feel amazing, plus they work well dressed up or down. Your choice- just don't leave 'em at home on a cold winter's night. Coyuchi Men's Plaid PJ Pants, $58. I'm a sucker for a pair of good PJ bottoms this time of year. I see this attractive plaid pair accompanying me on all my overnight travels this holiday season- including cozying up to the fire on New Year's Eve. Otis James Navy Herringbone Cashmere Scarf, $225. Herringbone. Cashmere, Navy. Otis James. Need I say more?